It’s been a busy and important week for anti-bedroom tax and welfare cuts campaigners. Some of HOOH went to Manchester on Saturday 7th Sept to meet Raquel Rolnik, UN Special Rapporteur for Housing. As you can imagine, some of the stories we heard from tenants across the country were totally appalling. Not surprisingly, Rolnik condemned the bedroom tax in a statement this week. She also criticised the longer-term policy of not investing in social housing, selling off social housing and the inflated prices of private rent and buying property at a time when wages are dropping. 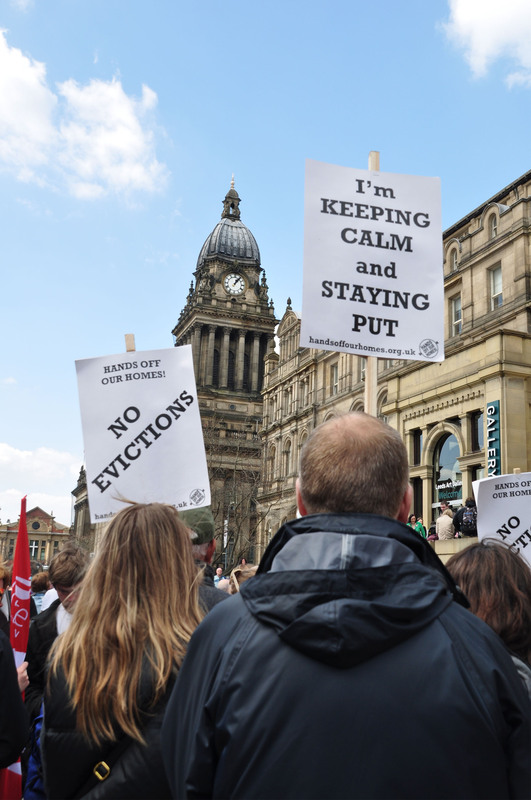 On Wednesday, as the UN representative made her statement, councillors in Leeds prepared to debate a motion to adopt a ‘no evictions’ policy. HOOH pointed out this policy should be unconditional, and several amendments were laid down. As the Leeds Citizen blog has noted, ‘one council that has adopted a no-eviction policy, Bristol, could now be having second thoughts after a council working party found the policy was “not sustainable and should be ended as soon as possible”. However, a commitment to ‘no evictions’ could have been a way of holding the council accountable in the coming months. In the end, Councillors voted for a motion which did not call for ‘no evictions’, but merely congratulated council and other staff on hard work done to help tenants cope with the policy! Not good enough. We’ll be publishing a blog about this in the next few days. We attended the Magistrates Court on the 5th September to support and talk to people in council tax arrears. One tenant we had spoken to in advance was prepared and his case was adjourned with no liability order and no deductions from benefit. Whilst we tried to instil confidence in a few other attendees they were almost all brow beaten into submission by Council officers and some were close to tears. We have contacted Councillor Gruen about the way these cases are being handled and will publicise the answers soon. The next Council Tax summons day is Thursday the 19th September – so anyone wanting to help with advice and leaflets should be outside Leeds Magistrates Court at 9.45.